Kadam Rasu'l, or the Prophet's foot, a mosque [Gaur]. bl.uk > Online Gallery Home	> Online exhibitions	> Asia, Pacific and Africa Collections	> Kadam Rasu'l, or the Prophet's foot, a mosque [Gaur]. Coloured aquatint from a painting by Henry Creighton, engraved by Thomas Metland, and dated to 1817. 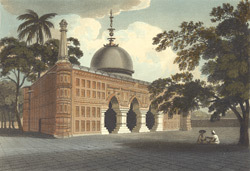 The Qadam Rasul Mosque was built by Nusrat Shah in 1530 on top of relics supposedly belonging to Muhammed. It houses a representation of the prophet's footprint which was found on a stone brought from Medina. The north and south walls have rows of recessed panels and the arched entrances are carried on massive octagonal piers. There is a central domed chamber surrounded on the east, north and south sides by verandahs. The building is constructed of brick and its surfaces are decorated with relief terracotta panels of floral and vegetal motifs. It is still a place of worship today.